Curious about those round rubber things attached to your wheels? 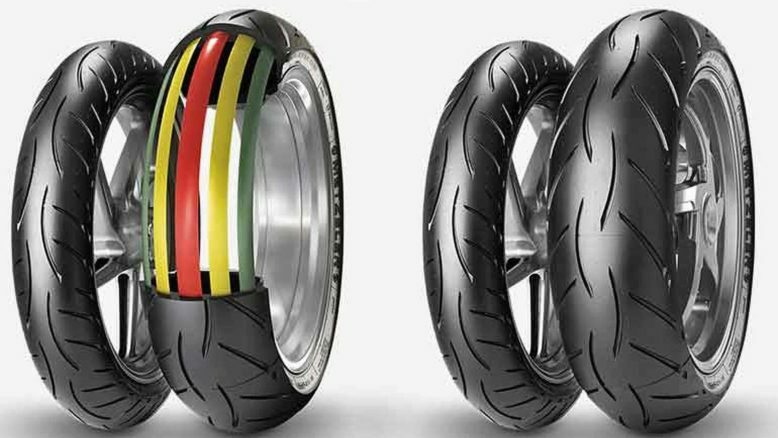 AMERiders Gives you our Full Informational Guide to Motorcycle Tires. Motorcycle tires are more than just simple black rubber hoops that keep your wheels from grinding against the trail or road surface. We will break them down and give you more information on them. These are state of the art traction providing technology that continues to get better every year, even though the basic concept remains the same as it always has. Tires work so well by providing a cushion of air between your machine and the ground, which give tire its shape, allows them to conform to the surfaces and soak up bumps. 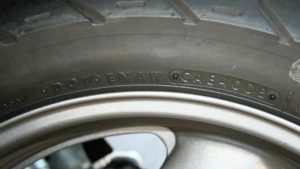 How did Motorcycle Tires come about? The first part of our Informational Guide is to tell you how they came about. Back in 1887, John Dunlop developed what is considered to be the first practical pneumatic tire for a tricycle, and he received a patent for it on December 7, 1888. Commercial tire production started shortly thereafter in 1890 in Belfast, Ireland. Mr. Dunlop partnered with William DuCros, forming what later became Dunlop Rubber Company. This basic design has remained in use throughout the world for more than a century. Originally, tires were made from natural rubber, and these days virtually all tires today are made from synthetic rubber which is a blend of petroleum, along with chemicals such as sulfur, carbon black and silicone. Tires are built up in stages, starting with the assembly of the cord and belting structure, and after that, rubber is applied and molded, then vulcanized with extreme heat to join it all together and prepare them for use on our favorite motorcycle. The next part of our Informational Guide is to tell you what they do. Tires not only provide traction for accelerating, braking and turning but also serve as a part of the suspension. Like we mentioned earlier, the tires soak-up the first part of the impact from bumps, before the fork and shock even begin to work. They are also called upon to perform well in a wide variety of conditions, including extreme heat, cold, and wet. You actually bet your life on your tires, so aren’t they worth taking a little time and attention for their care and condition? Pay close attention to what your tires are telling you while you’re riding. If steering seems odd or mushy, or if cornering and braking response feels heavy, there’s a good chance your tires are underinflated. Vibration or wobble may also signal that a leak or tire damage has occurred and failure is imminent. 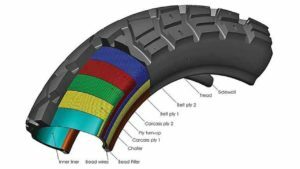 Different Types of Motorcycle Tires is our next part of our Informational Guide. The two primary types of tires are radial and bias. Within the bias, the category is regular bias and bias belted tires. The bias belted have a more robust construction. The terms Radial and Bias refer to how the internal cords and belts are arranged during the construction of the tire. Essentially, radial belts go straight across the tread at a 90-degree angle from side to side, whereas bias construction has the belts going diagonally across the tread area. This makes for different dynamic characteristics which greatly affect handling, wear, braking and rolling resistance between radials and bias tires. Radial tires are a newer design and are widely used on current model motorcycles, while bias tires are used mainly on some cruisers and older motorcycles. In general, radial tires run cooler (leading to longer life), have a stiffer construction (which makes them feel more responsive), and feature sidewalls with a lower aspect ratio, resulting in less flex. Bias-ply tires generally offer a softer, more compliant ride and, typically, a little lower price. Their other main advantage is load-carrying capability. In a given size, you’ll often see a bias rated to handle more weight. There are also many types of tread designs and patterns. It’s important to select the right tires for your bike and riding style, and a good reason to explain in our Informational Guide. Each type of tire is a compromise, so choose carefully. Generally, tires with large knobby treads are best in loose dirt and off-road use and tend to squirm a lot and wear quickly on pavement. They also don’t have a good grip on hard paved surfaces. Many dual sport and adventure bikes are fitted with less aggressive open tread patterns which tend to be somewhat better on the pavement and wear better, but they sacrifice traction in loose dirt, sand, and mud. Dual-purpose tires often are sold with a designation such as 50/50 or 90/10, indicating the percentages of traction on pavement vs. dirt. Be realistic with what you plan to actually do, as being wrong in either direction will likely make you unhappy with your choice. Tires used on the street should always have a DOT approval molded into the sidewall. Street tires generally have a much less-aggressive tread pattern than tires used off-road. Street tires will always have rain grooves to channel water away from the center of the tire in an effort to improve grip and prevent hydroplaning in the wet. Sportbike tires which are designed for use on dry roads and race tracks have fewer rain grooves and therefore sacrifice grip in wet situations. The fewer grooves typically result in more surface and a potentially slight increase in traction. Avoid using slicks on the street, which are designed for race tracks and have no grooves, as they are illegal and can be dangerous on roads where there are wet patches, puddles, etc. Tires also come in various rubber compounds, which are blended to provide vastly different properties. 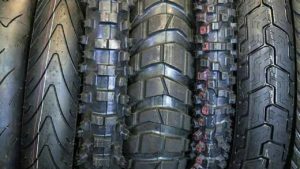 Generally, tires with softer high-grip rubber tend to wear out faster than tires with harder compounds, so it’s important to understand what a particular tire is designed for before purchasing it. Grip is a great item to discuss in our Informational Guide. Tire pressures should be checked frequently and is a good item to discuss in our Informational Guide. Technically, you should check your tire pressure every time before you begin to ride. There are several reasons for that. Tire pressures are supposed to be checked cold, at ambient temperature. As soon as you begin to ride the tires warm up from flexing and contact with the road, and the internal pressure rises. This results in getting a false inaccurate reading if you stop to check pressure, mid-ride at a gas station, for example. There’s also the obvious safety reason which is the reason for them being discussed in our informational guide. If a tire has picked-up a nail or otherwise is losing pressure, it could cause a crash on the way to the gas station, where you were planning to check tires. We recommend that you find a place on your bike (or carry it in your pocket if there’s no place on the bike) for a tire pressure gauge. Get a good quality gauge, cheap ones tend to be inaccurate. Look up the recommended tire pressure in the bike’s owner’s manual. Note that many models have different specifications not only for front and rear, but also for low speed and high-speed operation, along with light (solo) and heavy loads, plus passengers. Don’t use the pressure shown on the tire sidewall, unless the bike is at full load because the sidewall pressures shown are maximum pressures. Eventually, tires wear out and need to be replaced. Typically the rear tires start to square up, losing their rounded profile, as the center of the tread wears away faster than the shoulders. Front tires generally wear more evenly across their tread but may begin to develop scalloped wear known as cupping. Knobby tires are more obvious as the knobs start to wear, tear or break-off over time. Inspect your tires for adequate tread depth. 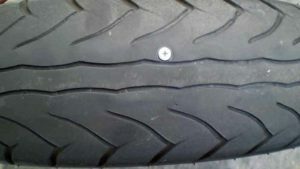 When the tire is worn to the built-in indicators at 1/32nd inch (0.8 millimeters) or less tread groove depth, or the tire cord or fabric is exposed, the tire is dangerously worn and must be replaced immediately. Also, inspect tires for uneven wear. Wear on one side of the tread, or flat spots in the tread may indicate a problem with the tire or bike. Consult your local dealer or mechanic for help. Inspect your rims also. If you have a bent or cracked rim, it must be replaced. A good practice is to plan ahead and have replacement tires lined up and ready to install before the old ones are totally worn out. Tubes should be replaced at the same time as the tires, on tube types. Old tubes deteriorate and are prone to cracking, which can lead to sudden failure, so a new tube should be installed whenever the tire is replaced. Make sure the tube (if it is used) is the right size and is compatible with radials if need be. 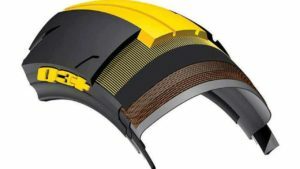 Rim strips should also be replaced if they look deteriorated. We are splitting this into two parts as it is quite a large article, the rest of it will be talked about on Friday. Let AMERiders keep you up to date with our Full Informational Guide to Motorcycle Tires.